I thought they’d all left for the season, but as I was cutting some basil in the vegetable garden at sunset I heard the unmistakable sound of a hummingbird — a soft but insistent vroom! noise not unlike that of a toddler playing with a toy car. 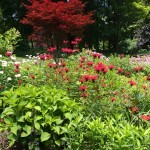 I turned around, hoping to find it — in the zinnias? among the nasturiums? — but it was already gone. It was almost as if it had come to say goodbye. According to the Cornell Lab of Ornithology, Ruby-throated Hummingbirds (the only ones that breed in Eastern North America) and swifts are in the same taxonomic order called “Apodiformes,” meaning without feet. Their legs are so short that they can’t do much more than shuffle along like arthritic old folk. 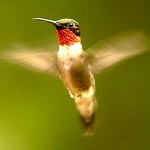 Most of the time, however, you will only see the hummingbird in flight. 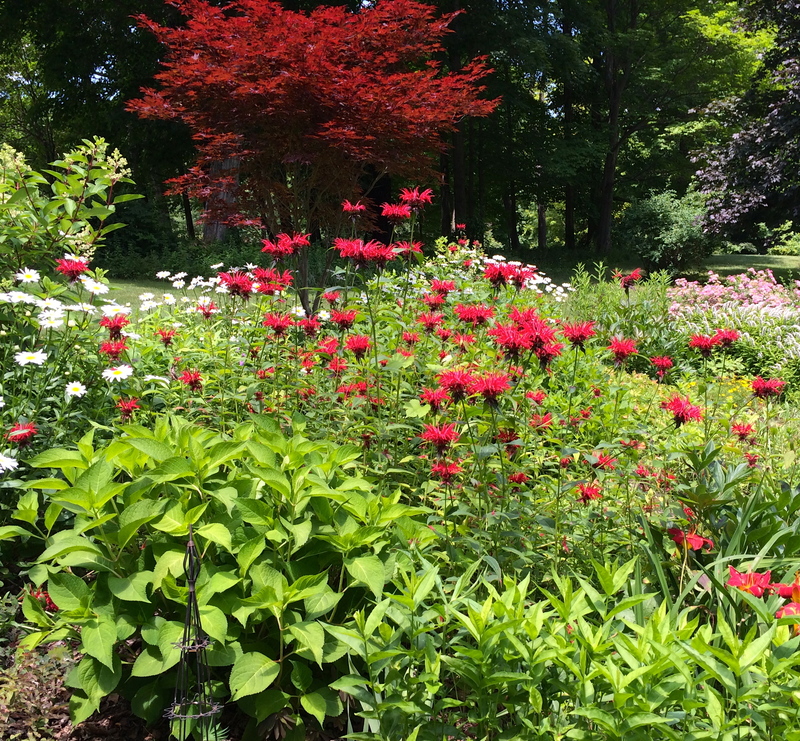 It keeps a busy schedule at our place in the summer, flitting from monarda to lobelia in the back sun garden then zipping around to the side of the house to sample the flowering Rose of Sharon or the petunias dangling from the window box. It is here that it will often come face to face with our grey tiger-striped felis domesticus, sprawled against the screen on the inside sill. The hummingbird, wings beating at an average of 53 times a second, will hover just inches away from our thoroughly outraged cat, sometimes for several minutes at a time, before darting off to find its next source of nectar. I planted the sun garden with hummingbirds, butterflies, and bees in mind and have been richly rewarded every summer by their loyal patronage. 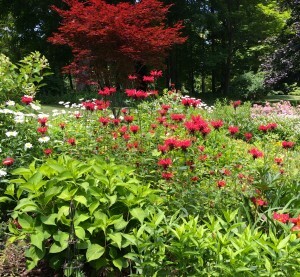 The hummingbirds love the red monarda, in particular, with its long fluted flowers and, in fact, build their nests in the old willow tree just above a big patch of the stuff. As the average life expectancy of the ruby throat is only 3 to 4 years this means that generations of hummingbirds have been taking up residence in our willow tree. I like to think they consider it their summer home. 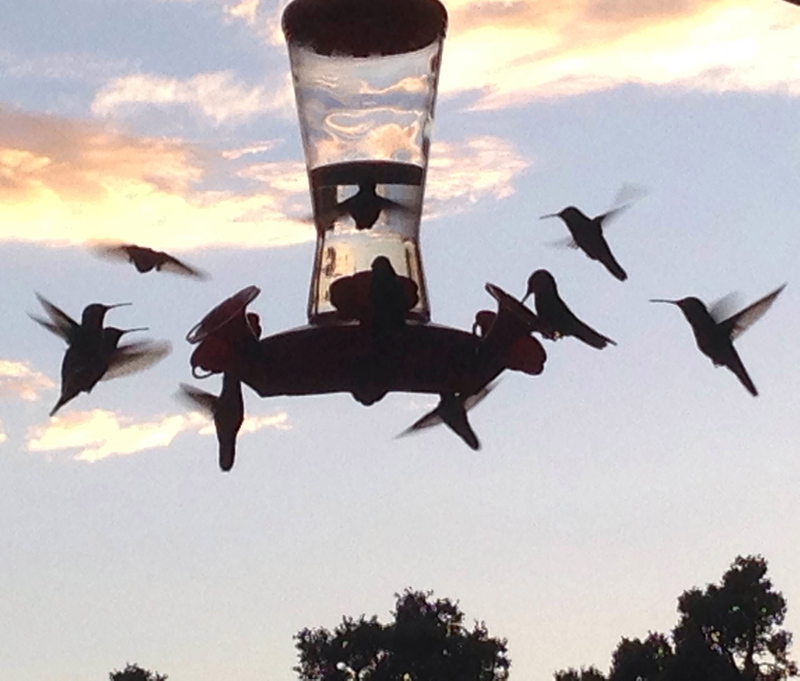 I love this photograph of hummingbirds at the feeder that was just sent to me from a friend in Santa Fe. There are 14 species of hummingbirds in New Mexico; the most common are the Rufous, Calliope and Broad-tailed. It’s hard to tell what kind these are, but they’re certainly lovely. 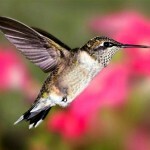 I like the cool facts about the Hummingbirds and the pictures. I also like the cover of your new book. Thank you so much for writing, Lucian. I’m so glad you like the cover of my new book. I’m very happy with it, too! Some years ago, when we lived in Raleigh, we used to be visited by hummingbirds every summer, almost every afternoon. They would hover around the back porch, where we set up a feeding station. It was one of the most magical encounters in nature that we have ever had, just along the lines of what you described in this delightful piece. 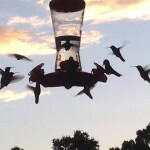 Is there anything in the world quite like a humming bird in flight? Thanks, Anders! They are magical — fairylike, really. And it’s hard to see one — even for just an instant — without feeling a little jolt of happiness. I, too, have wonderful humming birds in my garden. I love to sit on our screened porch (I guess something like your cat, but with a kinder attitude!) and watch their amazing demonstrations of how to stay in air in one place. A miracle of nature to be sure. Thanks, Susan. Yes, they are miracles of nature — among so many! If you plant a honeysuckle bush the hummingbirds will entertain you non-stop. 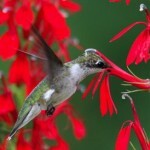 I don’t think that we have the ruby-throated hummingbirds in Pittsburgh — quite beautiful! Thank you, Gordon. I haven’t seen them on my honeysuckle, but that’s probably because we’re farther north than you and the honeysuckle has bloomed by the time they return. Do you see at lot of hummingbirds in Pittsburgh?